Moving heavy loads, equipment or other heavy objects would be very difficult if not impossible without the aid of a pallet jack. Pallet jacks safely lift the load, using a hydraulic jack. A hydraulic jack uses hydraulic oil to transfer the pressure needed to lift the load. Part of the pallet jack's maintenance is checking the hydraulic oil to ensure that it is at the proper oil level. Knowing how to fill the pallet jack with hydraulic oil to keep the hydraulic oil at its proper oil level is essential to keep the pallet jack in top working condition. 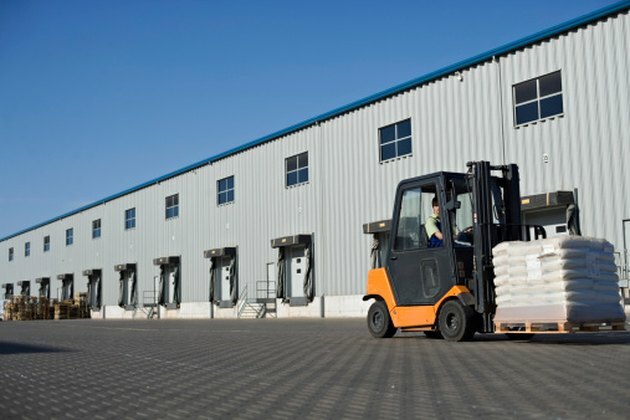 Park the pallet truck on a hard, level surface. Move the pallet jack's control lever to the "Lower" position to completely lower the pallet jack's fork. Remove the hydraulic oil reservoir plug and washer by unscrewing the plug, using the flat-head screwdriver. Refer to the owner's manual of the pallet jack for the location of the hydraulic oil reservoir plug. Add the hydraulic oil to the hydraulic oil reservoir's fill hole, using the funnel. Remove the funnel to check the oil level in the hydraulic oil reservoir. The oil level should be up to the bottom of the hydraulic oil reservoir's fill hole. Pump the pallet jack's handle 10 to 15 times to bleed the hydraulic unit of the pallet jack. Bleeding is done to remove any trapped air in the pallet jack's hydraulic system. Repeat steps 3 and 4 until the oil level in the hydraulic oil reservoir is stable at the bottom of the hydraulic oil reservoir's fill hole. Return the hydraulic oil reservoir plug and washer to the hydraulic oil reservoir's fill hole. Screw it on tightly, using the flat-head screwdriver. Wipe any excess hydraulic oil on the hydraulic oil reservoir with the rag. Justin Mark started writing professionally in 2004. He worked as a writer for his town’s newspaper, "The Valley Reporter." His writing focuses on articles about automobiles, building, lawnmowers and technology. He holds a Bachelor of Arts in journalism from the University of California, Los Angeles.